Vouliagmeni is an seaside municipality 20 km south of Athens. It sits on the southwestern foot of the Hymettus mountain range. Vouliagmeni is bisected by a palm tree lined boulevard, Athinas Avenue, which arrives from Athens as Vouliagmenis Avenue, then runs parallel to the seashore and continues southwards. The area east of the main road is a rocky slope of a foothill of Mount Hymettus, and the bulk of the town is built there, along with the local elementary school, post office, banks and town hall. 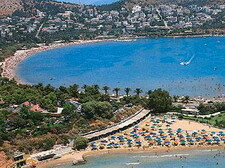 The western half, located between Athinas Avenue and the sea, is covered with pine trees and consists of two peninsulas, Megalo and Mikro Kavouri ("Big Crab" and "Little Crab") that feature sandy and pebble beaches in between rocky shores, luxury hotels (including the Astir Palace Hotel occupying most of Mikro Kavouri), the local high school, the picturesque chapel of "St. George of the crab", two marinas, an aquatic sports club (the "Nautical Club of Vouliagmeni", see below), a sports club (football, basketball, volleyball, tennis) and upscale restaurants, taverns and cafeterias on the waterfront. The Mikro Kavouri is connected to the mainland with a narrow, sandy isthmus commonly referred to as "Laimos" (Lemós, i.e. the "Neck"), flanked by two public beaches. The Megalo Kavouri is land largely owned by the Church of Greece, which maintains an enclosed, protected pine forest and an orphanage. A small air force camp is also located there. Dotted with lavish villas, the two Kavouri areas are among the most expensive pieces of housing real estate in Greece. The Vouliagmeni beaches are consistently awarded the coveted EU blue flags for environmental excellence. The triathlon competition for the 2004 Summer Olympics took place in this area. The small, rocky islet of Fleves lies off shore. The luxurious Arion Resort and Spa overlooks the Saronic Gulf in Vouliagmeni, Greece, 25 kilometres from central Athens. Athens Airport (ATH) is 25 kilometres away. Occupying an entire tree- lined peninsula, the modern Arion Resort and Spa has panoramic views of the sea and the nearby islands. Private butlers and a limousine service are available for VIP-floor guests (surcharge). The Club House offers fresh seafood dishes on a veranda which juts out over the sea. There's Greek dining every Monday at Kymata restaurant, with views over the beach and pool. More sea views are on offer at the more formal Blue Hytra Restaurant, which specialises in local dishes. 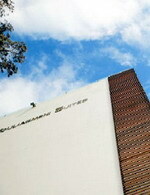 There are also two bars; a modern lounge bar and the Blue Pool bar. High-speed Internet connections are available in public areas. The Arion Resort and Spa features a modern spa, a fitness centre, three private beaches and three swimming pools, including an Olympic-size pool. There are supervised activities for kids. Armonia Hotel is situated in the most central and cosmopolitan coastal area of Vouliagmeni, 3 minutes walk from the lively Vouliagmeni Beach and 5 minutes walk to the center of the resort. 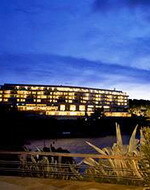 The unusually designed buildings comprise of 140 rooms and 32 suites with either sea or pool or garden views. All rooms have A/C, satellite TV, fridge, direct dial telephone, modem ports for internet access, voice mail, radio and balcony. 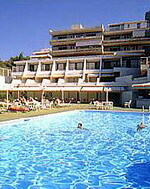 Between the buildings there is a large freshwater swimming pool with a section for children surrounded by sun loungers, with poolside snack bar. The swimming pool is available from April 15th and the snack bar from June 1st. Our buildings are both, fully air-conditioned and the facilities include a large open plan reception with souvenir shop, split level cafeteria-bar, lounge, 5 conference rooms, room service and a restaurant on the 1st floor serving bouffet breakfast, set menu and a la carte menus. Located along the Athens Riviera, The Westin Athens Astir Palace Beach Resort is a seaside resort in Vouliagmeni, Greece. The hotel is 25 kilometers from the Acropolis and Olympic Stadium. International airport Eleftherios Venizelos is 24 kilometers away. The hotel is one of three properties forming a modern resort set in lush gardens sprawling across 75 acres of pine-dotted private peninsula featuring views of the Saronic Gulf and Mediterranean Sea. Natural light pours into The Westin Athens Astir Palace Beach Resort's lobby, complete with modern artwork and floor to ceiling windows. The hotel offers guests a fitness experience through jogging paths, floodlit sports and water courts and a fitness center. A spa center includes seaside views, a hair and beauty salon, massage and revitalizing body treatments. Pools and private beaches, a helipad, fine dining and lounge areas can be found throughout the resort. On-site dining facilities serve continental selections of fish, steak, chicken, Greek and Italian cuisine throughout each day. The Classical Vouliagmeni Suites hotel is located 200 metres from the beach in Vouliagmeni, Greece. Central Athens attractions like the Acropolis are 18 kilometres away. Looking out over the Saronic Gulf, the Classical Vouliagmeni Suites hotel features a colourful, pillared lobby dotted with comfortable sofas. Concierge staff can provide information on local attractions and exchange currencies. Wireless Internet access is available throughout the hotel. There's complimentary onsite parking, and airport transportation (surcharge) can be arranged. Adam & Eve Restaurant looks out over the sea, and offers Greek and international dishes with an excellent wine list. There's a poolside bar for cocktails and other drinks and room service is available 24 hours a day.